The cosmic microwave background is an extraordinarily bit of observational data. It not only confirms details about the big bang, it also tells us things about the structure of the universe as a whole. One of the striking features of the CMB is how remarkably uniform it is. There are slight variations in the temperature of the CMB at different points in the sky, but this is exactly what standard cosmology predicts. 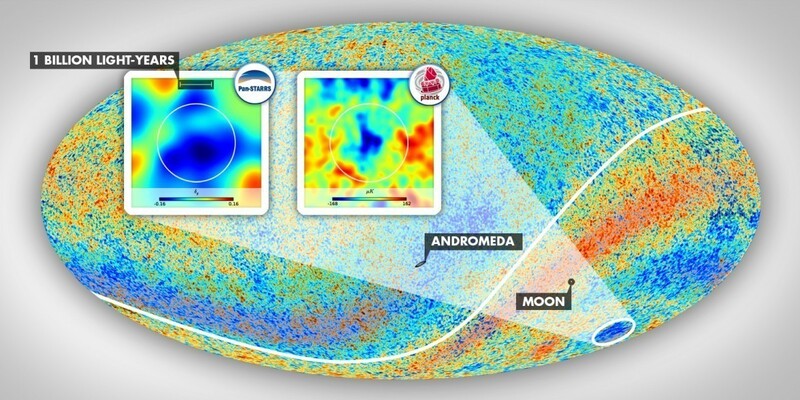 But there is one patch of the cosmic background that’s a bit unusual, and it’s known as the CMB cold spot. The CMB cold spot is not particularly colder than other cold regions of the CMB, but it is unusual because it is a particularly cold region surrounded by a rather warm region. Simulations of random fluctuations in a CMB estimate that the odds of such a cold spot happening in the universe is about 1 in 100. So it’s possible that it is just a random fluctuation. But the 1% odds is small enough that some astronomers have looked for a possible cause, and these ideas have ranged from the mundane to the wild. The more speculative ideas argue that it could be due to gravitational influences from a parallel universe, leading some headlines to claim that the cold spot is evidence of the multiverse. A more mundane explanation is that the region appears colder because of a well known phenomenon called the Sachs-Wolfe effect. Basically, the gravitational effects of galaxy clusters between us and the CMB make it appear slightly warmer than it actually is. A lack of clusters between us would therefore make a region appear relatively cooler. If there is a particularly large void in the direction of the cold spot, that would explain the apparent anomaly. 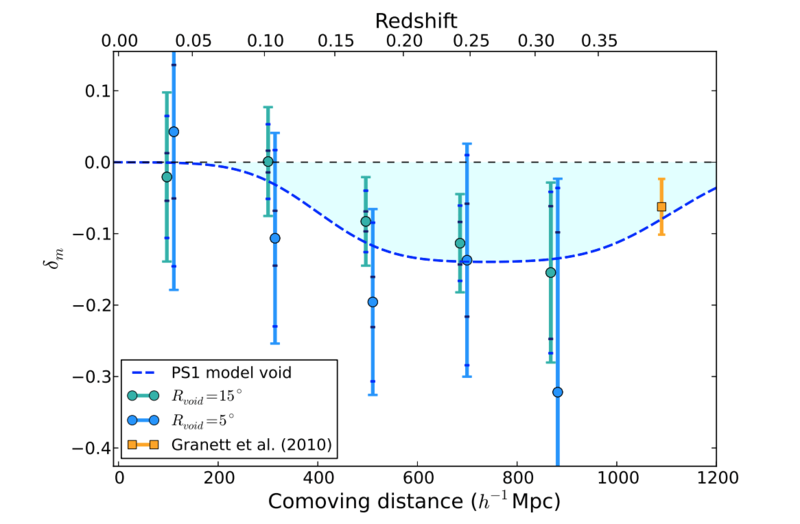 Relative density of galaxies in the direction of the CMB cold spot. The authors are careful to point out that this is an initial measurement of the Eridanus void, and further studies will determine whether the void will fully account for the cold spot, or if there still might be an anomaly in the CMB, but this work does show the void is the most likely cause. So the standard model of cosmology can come back out of the cold. If galaxies can make the CMB colder or hotter, then how do they affect the rest of the measurements of the CMB? isn’t the term “void” a bit mis-leading?